Capaulin is a fruit from the Central America and is probably a native to the region from Mexico to Colombia. 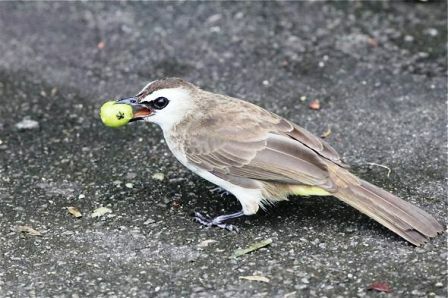 It has been recently introduced to Brazil and South East Asia. It is capable of getting established in other lands very quickly and in a few decades start looking like a native plant. 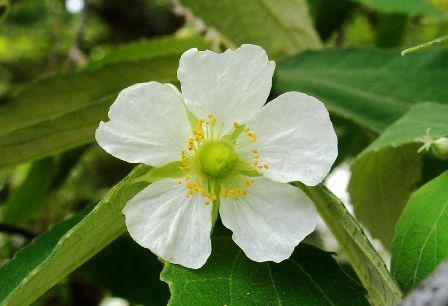 A small evergreen tree, 3-12 m tall, growing and flowering continuously on fan-like branches; branches horizontal, pendent towards the tip, soft hairy. Leaves simple, ovate-lanceolate, 4-14 cm x 1-4 cm, with prominent asymmetry of the leaf blade base; leaf margin serrate, lower leaf surface grayish pubescent. Flowers in 1-3(-5)-flowered supra-axillary fascicles, hermaphrodite, pentamerous with white petals; number of stamens increasing from 10-25 in the first emerging flower in the fascicle to more than 100 in the last; development of the superior ovary declining in the same order, so that from the third and later, flowers do not normally set fruit. 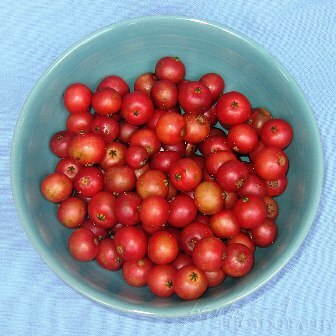 Fruit a dull-red berry, 15 mm in diameter, with several thousand tiny seeds in the soft pulp. The fruits are sweet and edible. These are fondly eaten by people, especially school children. The berries can also be made into a very good jam. Capaulin fruits are quite nutritive and a good source of due their high carbohydrate content. 100 g edible pulp of the berries contain approximately: water 76.3 g, protein 2.1 g, fat 2.3 g, carbohydrates 17.9 g, fibre 6.0 g, ash 1.4 g, calcium 125mg, phosphorus 94 mg, vitamin A 0.015 mg, vitamin C 90 mg. The energy value is 380 kj/100g. 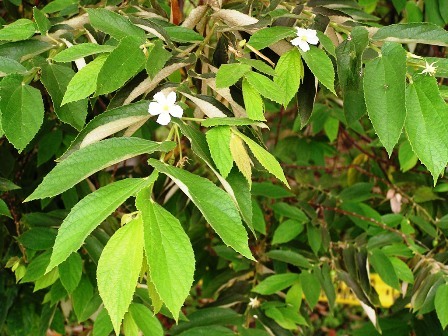 The flowers are used in the Philippines to prepare an infusion against headaches’ colds, etc. The bark is pliable and used in villages as rough cordage. The tree serves as road side shade tree. The wood is soft and is valued mostly as fuel. Capaulin is one of the most common road side trees in South East Asia, especially in the drier parts such as in eastern Java. It establishes itself in trodden yards and along shop fronts where no other tree takes root. 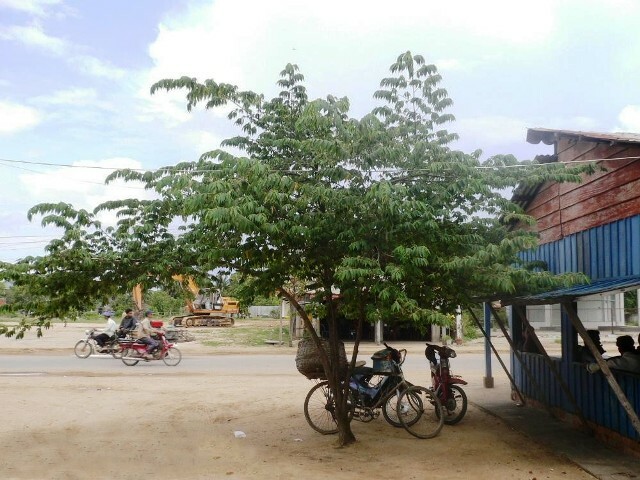 This tree is not normally cultivated, it spreads spontaneously. Seedlings flower within two years. Air layers made for home gardens fruit straight away. Rich moist soils ensure continuous production which is sustained by replacement pruning. No serious diseases or pests have been reported, apart from bats. Fresh seed germination is enhanced by passage through the digestive tract of bats. The seed is well-represented in the seed bans of forest soils and requires in the seed banks of forest soils and requires the high temperature and light conditions of large gaps in the forest for germination; the seedlings do not tolerate shade. Broadly, there are two types of fruits viz. yellow fruited and white fruits. Within these types there exists a large variation in fruit size and quality. So there exists a lot of scope for selection of improved varieties.